ALEVE is available without a prescription, so it's easy to get relief that lasts all day, without the necessity of seeing a doctor. Aleve is the only thing we use in our household. Great product. Our family loves it. Use every day for pulled muscles and other pains. 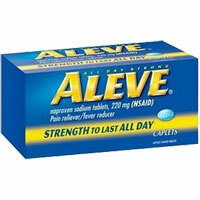 I use Aleve every day to deal with pain ... its wonderful. I couldn't get by with out it.